I had two large format scenes lined up from the earlier scoping: a 5×4 of exposed river roots along the River Murray and a 5×7 of an edgelands scene near the Little Murray River on Pental Island. 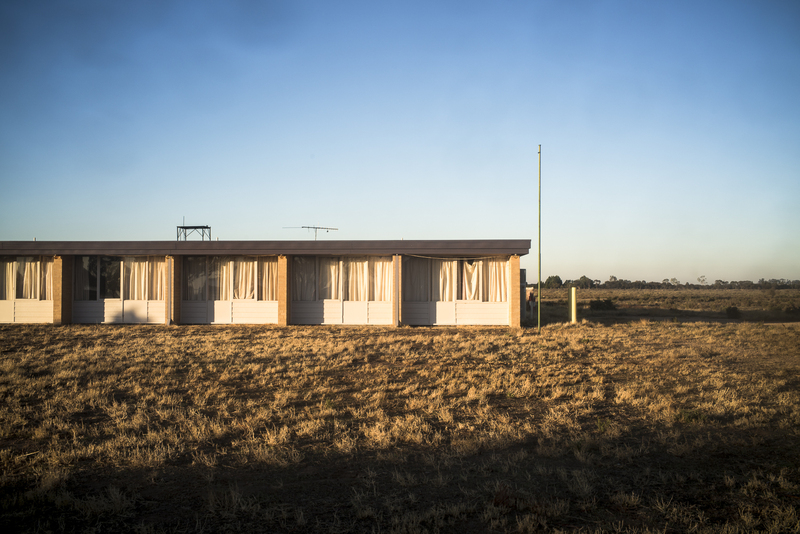 I also wanted to photograph the deserted motels around Lake Boga in the early morning light, and then some of the shops in the township at Nyah West in the late afternoon. That was the plan. The early morning motel photoshoot with a medium format camera went okay, but I just couldn’t get it together at Nyah West in the afternoon. 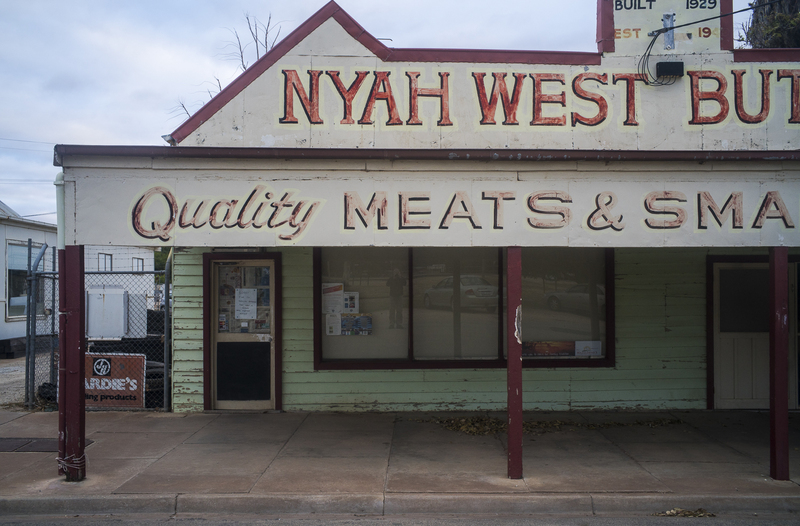 Stuart Murdoch had photographed around Nyah West when he visited Swan Hill to see the Mallee Routes exhibition. His images confirmed my impressions from my earlier visit with Eric Algra and Gilbert Roe, that this was rich photographic territory. I reckoned that I could do some large format work around the township. It was not to be. There were a lot of people about in the town in the afternoon, and that threw me. I had imagined Nyah West to be an empty, deserted town. A ghost town as it were. My plan had been to set up the 5×7 Cambo in the main street and to photograph the empty shops, but all the comings and goings in cars made that plan rather impractical. 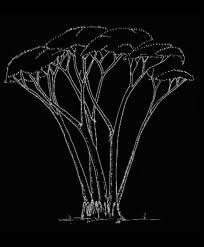 From what I could see people worked in and around Swan Hill and they lived in Nyah West because the housing was cheap. Although most of the shops in the main street are empty, or had become private residencies, the IGA and the pharmacy were open, and people came and went there after school and when they had finished work. I then remembered that I my earlier visit to Nyah West was on a weekend, and that was why the town looked deserted. With my large format photography plan impractical I ended up walking around the town with a digital camera for a couple of hours. 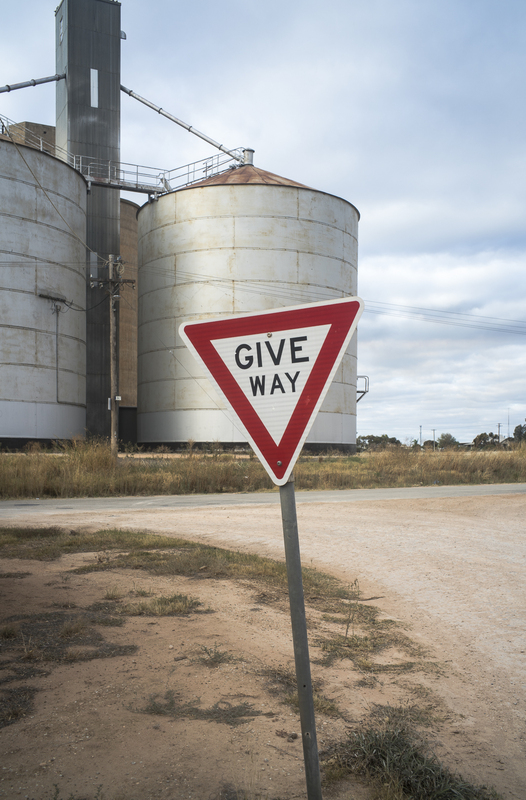 I was scoping for possible locations for a future visit with a large format camera, to build up my digital gallery, as well as producing images for a snapshot style photobook that would be a part of the 2019 Mallee Routes exhibition at the Murray Bridge Regional Gallery. A photobook facilitates other means of display and distribution than gallery exhibitions in that it allows people to read the work who would not make it to seen the images in exhibitions, which are usually only on for a month or so in a distant location. The strength of the photobook is that it enables me to move beyond the fetishizing of the single image–the ‘one’ of modernism with its essential universal meaning with its emphasis on the supremacy of the author’s voice to a visual narrative with multiple meanings. The photobook places the visual in a predominant position –as opposed to the text— and it foregrounds how the imagery of picturebooks is part of a larger set of social, cultural, economic, historical, and artistic practices—a visual culture.